7月 16 12:19:05 Alpha systemd: Started Monitoring of LVM2 mirrors, snapshots etc. using dmeventd or progress polling. -- Unit lvm2-monitor.service has finished starting up. 7月 16 12:19:05 Alpha systemd: Reached target Local File Systems (Pre). -- Unit local-fs-pre.target has finished starting up. -- Unit systemd-fsck@dev-disk-by\x2duuid-a496a10c\x2d926e\x2d4b5f\x2d9463\x2dc1b09f52aa0b.service has begun starting up. 7月 16 12:19:05 Alpha systemd: systemd-fsck@dev-disk-by\x2duuid-dc5b8eb5\x2d1d65\x2d43d9\x2d9134\x2d20301def4edf.service: Bound to unit dev-disk-by\x2duuid-dc5b8eb5\x2d1d65\x2d43d9\x2d9134\x2d20301def4edf.device, but unit isn't active. 7月 16 12:19:05 Alpha systemd: Dependency failed for File System Check on /dev/disk/by-uuid/dc5b8eb5-1d65-43d9-9134-20301def4edf. -- Unit systemd-fsck@dev-disk-by\x2duuid-dc5b8eb5\x2d1d65\x2d43d9\x2d9134\x2d20301def4edf.service has failed. 7月 16 12:19:05 Alpha systemd: Dependency failed for /home/zero/Disk/8TB-2. -- Unit home-zero-Disk-8TB\x2d2.mount has failed. 7月 16 12:19:05 Alpha systemd: Dependency failed for Local File Systems. 7月 16 12:19:05 Alpha systemd: local-fs.target: Job local-fs.target/start failed with result 'dependency'. 7月 16 12:19:05 Alpha systemd: local-fs.target: Triggering OnFailure= dependencies. 7月 16 12:19:05 Alpha systemd: home-zero-Disk-8TB\x2d2.mount: Job home-zero-Disk-8TB\x2d2.mount/start failed with result 'dependency'. 7月 16 12:19:05 Alpha systemd: systemd-fsck@dev-disk-by\x2duuid-dc5b8eb5\x2d1d65\x2d43d9\x2d9134\x2d20301def4edf.service: Job systemd-fsck@dev-disk-by\x2duuid-dc5b8eb5\x2d1d65\x2d43d9\x2d9134\x2d20301def4edf.service/start failed with result 'dependency'. 7月 16 12:19:05 Alpha systemd: Reached target Sockets. -- Unit sockets.target has finished starting up. 7月 16 12:19:05 Alpha systemd: Reached target Paths. -- Unit paths.target has finished starting up. 7月 16 12:19:05 Alpha systemd: Reached target Network. -- Unit network.target has finished starting up. -- Unit systemd-tmpfiles-setup.service has begun starting up. 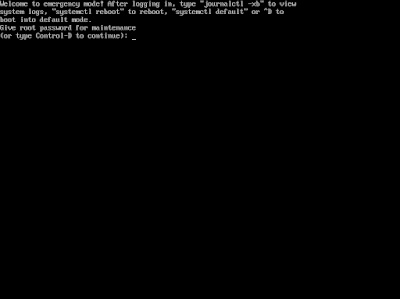 7月 16 12:19:05 Alpha systemd: Started Emergency Shell. -- Unit emergency.service has finished starting up. 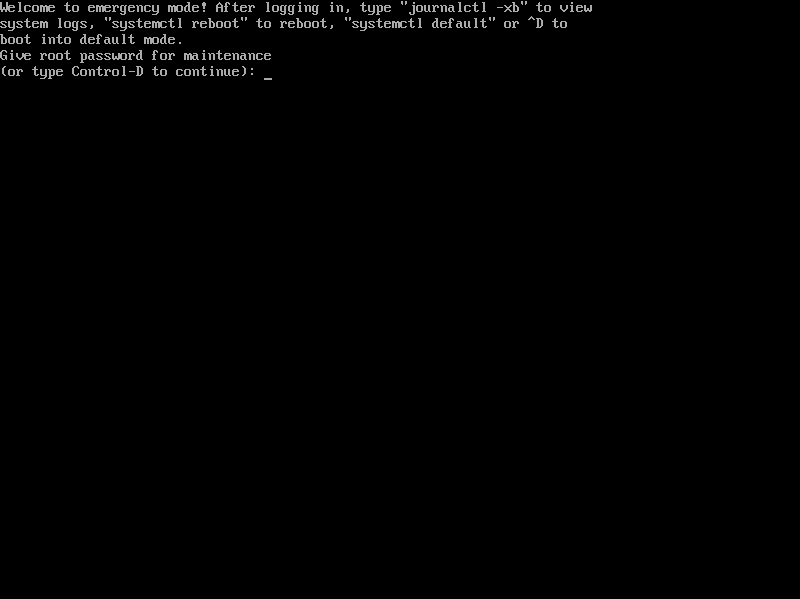 7月 16 12:19:05 Alpha systemd: Reached target Emergency Mode.